"We get a lot of hits off of FCH and that’s why we list with FCH. " 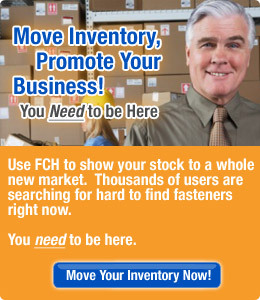 Search through tens of thousands of domestic (usa) fasteners in the FCH database of surplus, odd lot, slow-moving and hard to find fasteners. Just click a link below. Some fastener specifications require that they be domestic (USA & N.A. manufactured . Our search engine recognizes certain sets of words that indicate that a fastener is manufactured in the USA or in North America. We hope to grow this list, to make it useful to users and search engines, so if you can suggest fastener types that should be in these lists, please let us know.